The white-labelplatform for resellers and end clients with full control over pricing and design. 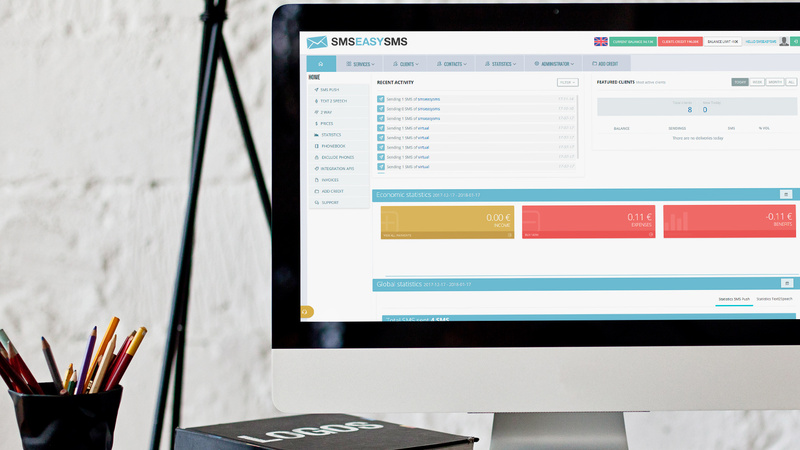 SMS-EASY-SMS is the white-label platform from which our clients can resell SMS. Customise our platform with your look & feel or integrate all services on your own platform via connection and integration APIs. Personaliza los costes de una forma totalmente flexible. Mantén el control sobre tus beneficios y optimiza los márgenes en cualquier momento. Completamente configurable por país. Use one of our subdomains or point your own domain or subdomain to our servers. Modify colours, logos, fonts, etc. both for your admin account and for each of your clients. Offer the bulk SMS service from your own platform. Use our connection APIs to integrate any of our services in a completely transparent way. Contact us to for any information about our services. I would like to receive communications about the products and services offered by nrs-group.com by email.